If you've been reading Stereophile over the last few years, you've heard of Voxativ. According to those single drver aficionados with audiophile budgets, the Ampeggio loudspeaker was the one to beat -- Stereophile actually named it Product of the Year in 2011. Impressive credentials. Here at T.H.E. 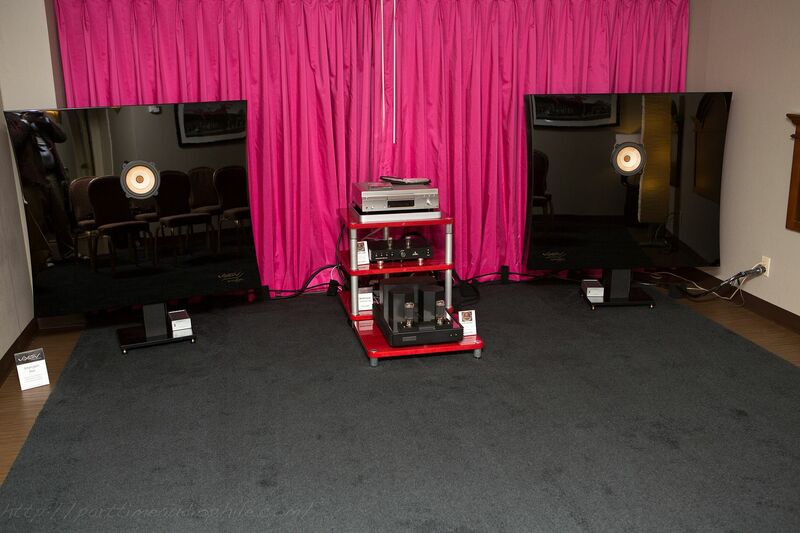 Show, Voxativ was showing their much larger, much more imposing, and much more expensive model, the Ampeggio Due. The driver, an in-house design that resembles a Lowther in shape if nothing else, is called the AC-Xp, and is Voxativ’s top-of-the-line. It’s actually made of wood, if you can believe it, mainly because it’s significantly stiffer than paper. Yes, paper is usually made from wood, thank you for paying attention. I’m just guessing here, but it seems safe to say that what they mean is that this driver is carved or shaped from wood, not pulp. Okay? Great. Moving on — the driver is a field-coil design, powered by a battery which is good for about 9 hours of playback before it switches to wall-direct and recharges. The loudspeaker itself, with its enormous baffle and narrow profile, is rated down to 25Hz. Sensitivity is a happy 100dB (the same as the award-winning Ampeggio, by the way). The $100,000/pair Due was set up across the corner — I’m assuming to help boost its in-room down-low response. A KR Audio VA 320 ($8,950) stereo amp (20wpc using a pair of KR 842VHD output tubes in Class A) was wired to a KR P-130 ($4,950) preamplifier. I’m going to be honest — I really don’t understand why this loudspeaker could possibly cost this much money, but whatever. The sound in the room was rich, and fulsome, and mid-range heavy (like most classic, horn-loaded, single-driver loudspeakers), so I suppose there will be many that would be thrilled by this sound, but … it’s jut not my cuppa.